When I was a kid, growing up in Lake Tahoe, my friends and I would ride our bikes four miles to catch the brown trout in Watson Creek. We would always come back with a stringer full and mom would fry them in butter in her favorite cast iron pan. Nothing tasted better. Years later, I still get excited when I see the rich brass color, dark brown and red dots break the surface of the water. I know I’m in for a great fight and a great meal. Originally introduced from Europe, brown trout are considered a non-native species and have been known to out-compete brook trout for food, sometimes threatening their survival. But that predatory instinct is what makes them so much fun to catch. They are a true game fish. There are a few tricks to catching them though and they have worked for me throughout the Sierras as far back as I can remember. First, it is important to remember how aggressive these fish are. They are quick and will go after anything that’s moving fast and looks like food (including their own young), so that’s why I prefer to use lures, retrieved faster than usual. If I’m trolling from a boat, we always troll fast for browns. As far as lures, my favorite trolling lure in bigger lakes is the Rapala jointed brown trout minnow (looks like a young brown.) In rivers, I have had excellent luck with a small Panther Martin spotted black. I like to throw across the river under a bank and retrieve it fast. Browns will attack it. Lures/spinners/spotted. But the best lure I’ve ever found is one I can’t find anywhere. I think I was digging through the bargain bin at Walmart when I found it (can’t remember) and it has no identifying marks. It absolutely kills them in small backcountry lakes without fail. It is a flatfish design with a dark brown top and a patterned yellow bottom. 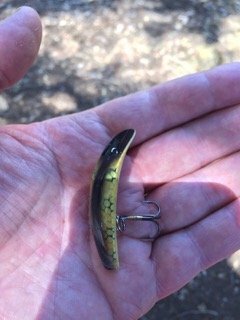 The closest lure I’ve been able to find is the frog pattern Flatfish lure. If you’re into bait fishing, don’t waste your time on anything artificial (Power Bait etc.). Browns will hit inflated worms with about 18 inches of leader ahead of a sliding sinker. Choosing a fly for browns is relatively easy because they will eat almost anything that looks like food. They love to eat land insects (ants, beetles, grasshoppers, and worms), so anything resembling these are worth a try. They do have a keen eye and it is worth it to use quality dry flies. I have had luck in the early summer with nymphs (caddis and mayfly) and you usually won’t go wrong if you use darker brown colors or olive colors. However you decide to fish for these beauties, you will be in for a treat. They are aggressive, smart, and challenging to catch, but once you hook one, you’ll realize why they’re one of the most sought after trout there is.